Madavoorpara declared a heritage site Thiruvananthapuram, Apr.19, 2010 Madavoorpara, situated about 20 km from the capital city of Thiruvananthapuram, has recently been selected as the latest project for heritage conservation by the Department of Archaeology, Kerala. Aimed to develop as a heritage site, the project involves restoration of the cave temple at Madavoorpara, setting up of a heritage park, and installing of a telescope to enjoy close views of the surroundings, especially the coastal side. Madavoorpara lies 300 feet above the sea level and houses a rock temple that attracts a lot of pilgrims, research students and tourists every year. 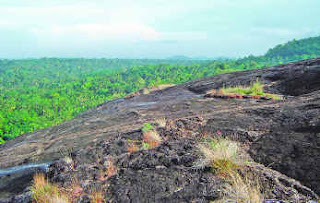 The rocky terrain is a favourite haunt of archaeologists and nature enthusiasts.More and more tourists are landing up at the spot for a weekend getaway to enjoy the wonders of nature. To reach the place, one can either trek up the rocky Chembazhanthy route through forest cover or drive through the winding Powdikonam road surrounded by plantations which ultimately leads you to the narrow stretch of road leading to the site. The 600-year-old cave temple that tells tales of antiquity adds charm and lends a mystic ambience to Madavoorpara. The deity is said to be of Lord Siva. However, some historians claim it to be an old Buddhist site. Sivarathri is a major annual event held here and a lot of devotees throng the premises during the festival. A perennial stream forms a small pond which is referred to as`gangatheertham' by the locals. The panoramic vista from the top of the 1,800 ft high rock is rejuvenating. The swaying coconut trees, distant hills and the sea make a perfect and rare collage in the saffron horizon. The cool breeze is refreshing while the changing colour of the evening sky is pleasing to the eye. The best time to visit Madavoorpara is in the evening.